We've been meaning to write about Ruby, and National Dog Day seems a perfect day to introduce her. Ruby, a little black Schnoodle, is a new addition in my family. We got her in April and she's an adorable little family pet. Her favourite things to do are going for walks on the beach and in the forest and she adores her ball. She'll never say no to a belly rub and is the friendliest little dog in our neighbourhood, greeting dogs and people alike. Since starting Tech Age Kids, she's joined us on our adventures. She comes to work, which is really good because we get some fresh air taking her for a walk over lunch. Her biggest achievement in this time was helping one of Tracy's kids get over a fear of dogs. Well done, Ruby! Yesterday we introduced her to her first bit of tech. A little game Tracy's boys made out of Lego Chain Reactions. You can design and build moving machines using pullies, channels and domino effects. They had to use a lot of their own Lego. 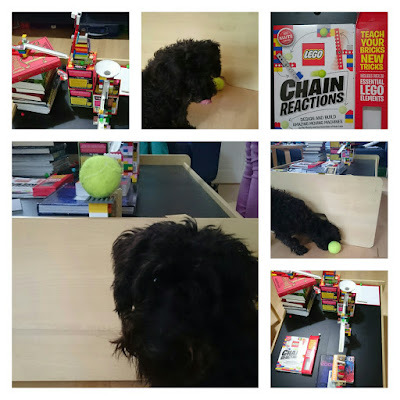 The boys built a chain reaction game for Ruby, which pushed a tennis ball over at the end. Ruby loved it, but it was quite tricky to capture the excitement on camera. We're planning to introduce Ruby to other tech we find fun and interesting and will write about it here at Tech Age Kids. But for now Ruby says, Happy National Dog Day to all her little furry friends.